Probably the best positioned house in South West Cornwall, located on an unspoiled stretch of coast near Porthleven; with breathtaking views to the Lizard to the east and across to Lands End to the west. The house perches on the edge of Rinsey Head and sits in grounds of approximately 30 acres making the house completely private – you feel almost like you are on your own island! Rinsey Head was built in the early twentieth century and is architecturally designed to maximise the views in every direction. Rinsey Head is a comfortably appointed, spacious family home, which exudes a real sense of adventure; on a beautiful summer day relax on the patio and drink in the views whilst a variety of seabirds circle above or on a wild Cornish day snuggle up in the cosy living room and watch the waves crashing below. Outside: There is parking outside the front door for at least 3 cars, and plenty of room along the upper part of the driveway for a number of other cars. There is a patio area, accessed through a glass door by the sitting room, an ideal spot for sundowners or a barbeque in the evening. The house is surrounded (on 3 sides) by private land, largely in its natural state, growing a mixture of wild flowers, heather, bracken and gorse. The coastline either side of the house is owned by the National Trust. Beautiful Rinsey beach can be accessed from the house and slightly further along the coastal path (15 – 20 minute walk or less than 10 minute drive) is the spectacular mile long sandy beach at Praa Sands. The property is a haven for walkers being situated on the coastal path with fabulous walks on both sides. Facilities & Services: Inclusive electricity, central heating and wifi broadband. The house is fully cleaned before your arrival and all bed linen, towels and beach towels are included in the price. Miscellaneous: Due to the nature of this spectacular location whilst welcome at Rinsey Head young children must be strictly supervised at all times, the owners cannot take responsibility for safety in the grounds of the house. Pets considered, changeover day Friday. This unique property is lovingly managed by Stylish Cornish Cottages, a small family run business. We have been providing holidays in West Cornwall for a little over 10 years now, and nothing is too much trouble when it comes to your holiday! We live in West Cornwall so know the house and the area inside out, any questions you may have or any experiences / advice you want booked we can do so for you. 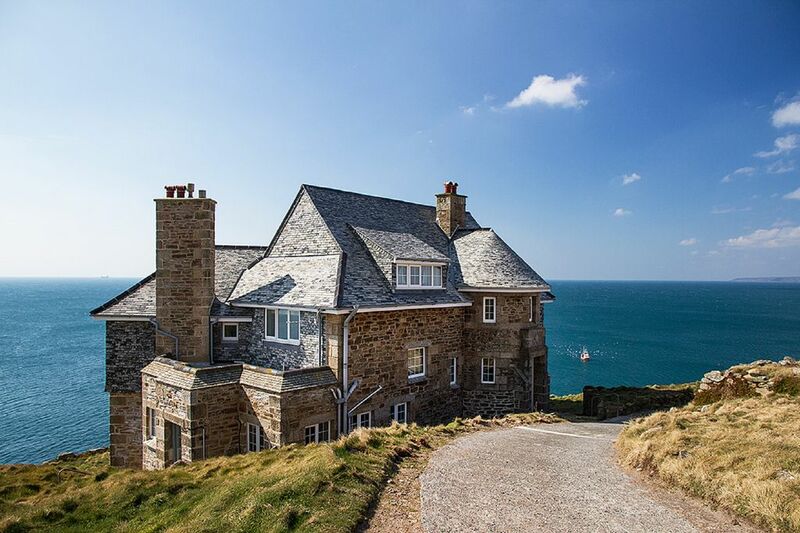 Rinsey Head is a totally unique property in an unrivalled location. Perched dramatically on the granite outcrop of Rinsey Head the house has 360 views across Mounts Bay; from the Lizard in the East and Lands End in the West. Perfect all year round with open fires, central heating and incredible storm watching and sunset viewing opportunities!! Family bathroom with bath and separate shower enclosure, the two double bedrooms have ensuite bathrooms, there is a downstairs WC and the bedrooms without ensuites have basins in the room. From the entrance hallway; there is a downstairs cloakroom with space to hang coats and store boots, wetsuits, surf boards etc. The reception rooms are found down a short flight of oak steps, the double aspect sitting room has spectacular views over Rinsey on one side and Praa Sands / Prussia Cove on the other, there is a large flat screen TV if you can tear yourself away from the windows. There is a well equipped kitchen with traditional two oven aga, separate gas hob, dishwasher and large fridge/freezer. Leading off the kitchen is a dining room with another large picture window with more astonishing views of both sea and Wheal prosper engine house at Rinsey. Due to the nature of this spectacular location whilst welcome at Rinsey Head young children must be strictly supervised at all times, the owners cannot take responsibility for safety in the grounds of the house. Pets considered, changeover day Friday. Privilege to stay here! Fabulous! Fabulous house in amazing location. We saw pods of dolphins swim past on several days. Also the excitement of the Coastguard helicopter flying over with, I could swear, Santa waving at me from the open door of the helicopter on Christmas Day! House was lovely and warm, and the Aga perfect to cook our Christmas goose in. The owners kindly left a nice tree and lots of goodies like mince pies, chocs etc which were much appreciated. Beds comfortable, enough bathrooms to make mornings easy. Beautiful footpath and hiking on the doorstep. Truly a privilege to stay in such a stunning property. Three generations gathered in this lovely house for a warm Autumn week. The location could not have been better, with wide sweeping views out to sea, glorious sunsets, sails, seals and even a whale. The house was extremely comfortable and well appointed - it felt more like a home than a holiday home - and everything was included that was needed. Thank you for a wonderful week. A fantastic week in a lovely house with views that we will all remember. We will definitely be staying at Rinsey House again! Stayed with a group of 9 friends, and had the perfect week holiday. Would recommend st michaels mount for a day trip, and the two beaches on either side of the house. Also some stunning walks. Could not recommend staying here more! Incredible location, amazing house, beautiful beaches, well cleaned and maintained, and a good price for what you get! 5*s all round, will definitely be returning. We've been back three times now and had a wonderful stay each time. We were born and brought up in Cornwall and now moved away but when we come back for holidays Rinsey Head House is the best location we have found it's simply epic. We hope that it remains a holiday let because it's our favourite place to stay. The house is always warm and clean and well equipped. Although not large it's very comfortable for up to 10 persons staying and having enough space without being cramped. One very small suggestion to improve it even more would be to move the washing machine out of the ancillary bedroom and have it in the downstairs cloakroom or better still in the garage if possible. From the moment we spotted Rinsey Head house as we approached on the cliff-top drive we didn't want to leave. The house is the perfect base from which to explore a lovely part of Cornwall. From beach and country walks to Medieval church wall paintings and mining heritage there is always something to do whatever the weather. We also spent a large amount of time with eyes glued to telescopes and binoculars as the views from the house over the sea are absolutely breathtaking. The house itself is clean, warm and comfortable with a really well equipped kitchen. It's the sort of place that should be booked up years in advance and part of me doesn't want to share how wonderful it was in case it gets too busy and we can't come back. If you want a holiday you will never forget then book this house. I promise you won't be disappointed.